Capitola Village real estate is found in a charming seaside resort community featuring a beachfront esplanade, distinct shops, and delicious restaurants. Homes for sale in this area are highly coveted due to the desirable location close to the sandy beach. Real estate in Capitola Village includes mainly single-family bungalows and beach houses that make great year-round residences or vacation homes. Although centrally located, these neighborhoods are tucked far enough away from the bustling shopping corners, but close enough to easily take advantage of their exceptional offerings! Keep reading to learn more about houses in Capitola Village. Browse the MLS below for all available properties. Register with Realtor® Lauren Spencer and sign up for email alerts when new homes in Capitola Village, CA enter the market. Capitola Village is a largely residential area, consisting of charming established neighborhoods with a little bit of everything, old and new. Capitola Village is defined by Monterey Ave, Bay Ave, and Soquel Creek., This includes heritage homes overlooking the bay, low-rise condos near Capitola Ave, and quaint beach bungalows. Single-family homes in Capitola Village are typically valued above $800,000 and range upwards the closer they are to the water. Townhomes and condos, in comparison, can start around $500,000 and are great for those seeking convenience over space. Those considering a condo-style residence will be interested in the Venetian Court condos; these brightly colored homes are located directly on the beach making them ideal vacation properties. These condos feature Mediterranean, Spanish Colonial, and Mission Revival architecture styles, and command breathtaking ocean views. The Venetian Court condominiums are on the National Register of Historic Places for being one of the first condo developments on the California coast. One of the biggest incentives for those considering buying a home in Capitola Village is the lifestyle. Galleries, coffee shops, boutique stores, wine bars, eclectic pubs, grace this community with things to see and do. Capitola Village is a friendly, walkable neighborhood in the heart of Capitola, California, which has been acclaimed by a variety of publications as one of the best beach towns on the West Coast. From breathtaking beaches to lush forested parks and mouthwatering local cuisine, this coveted community has it all. 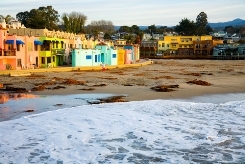 The Capitola Beach Esplanade, a lively beachfront strip lined with bars and restaurants, is a favorite gathering place for locals and visitors alike. If you love to eat locally, then you can't miss the authentic flavors of Paradise Beach Grille and Shadowbrook Restaurant. When you're in a hurry and need something quick, Gayle's Bakery & Rosticceria is a must-visit for freshly baked breads and gourmet sandwiches. Fans rave about their Blue Plate Specials, which feature meals that are both healthy and delicious, and you share them between two people! Curious to learn more about Capitola Village? 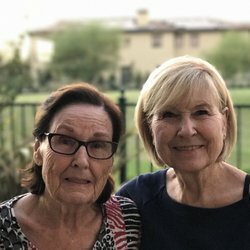 We have answers! 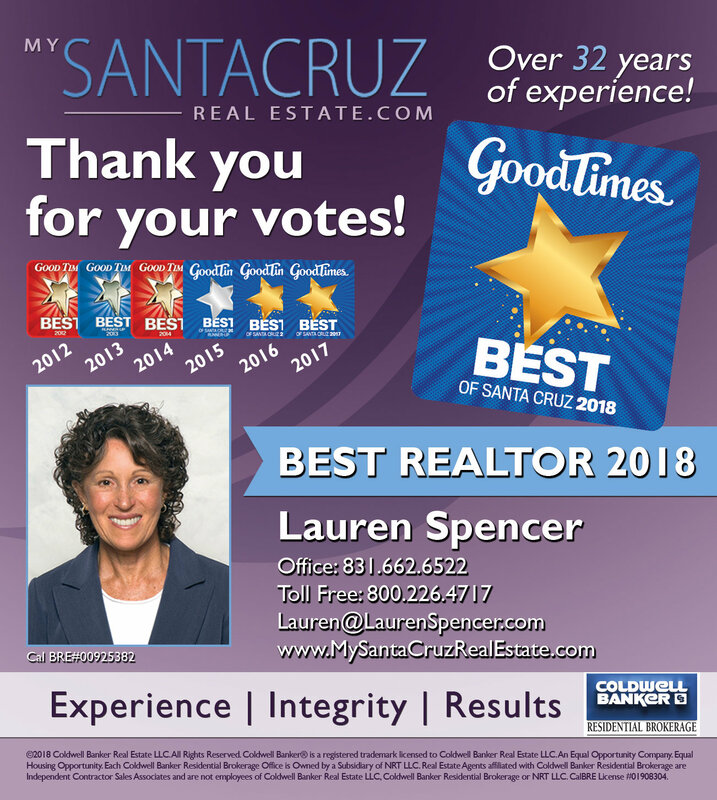 Give Capitola real estate agent Lauren Spencer a call at 800-226-4717 or send an email for more information on this area.